The release of a new iPhone always means one thing for tech watchers. Now is the time when you know precisely what’s included in the current model. It’s also the perfect time to start looking forward to next September when another version inevitably ships. Apple is like Old Faithful in its iPhone releases. Any rumored technology that didn’t make it into the iPhone 6s is fair game for the next iteration. Here’s a list of the four hottest rumors about the iPhone 7. Every other year, Apple has fundamentally altered the look of the iPhone in order to keep it fresh. One of the principal teachings of co-founder Steve Jobs was that aesthetics matter more than most product designers appreciate. He favored simple yet elegant appearances that created a form of positive identification with Apple products. Current CEO Tim Cook, a disciple of Jobs, follows the teachings of his mentor. He understands that in a crowded smartphone marketplace, the iPhone distinguishes itself by its style. Historically, the S-version of the product line hasn’t involved cosmetic changes. It’s the next number, the even year release, that does. 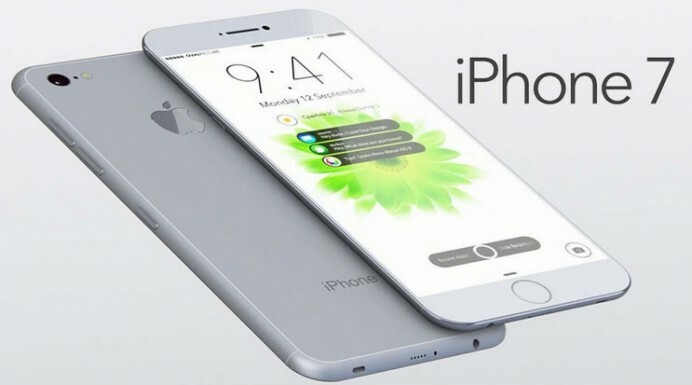 Expect the iPhone 7 to look different, with a curved screen as a distinct possibility. It wouldn’t be the first time the company has followed the lead of a major competitor in screen design. Whatever the decision, expect the standard Apple practice for the iPhone 7. It’ll be thinner in size while somehow offering a larger screen with better resolution. The wizards at Apple somehow pull off this feat with every new version of the iPhone. The basic law of computer technology is that processing power is a moving target. For years, people have doubted whether smartphones would enter the same arms race as personal computers. The larger component systems started featuring a war between parts manufacturers over whose new chips were faster. In order to perform the same calculations more quickly, they started synchronizing multiple processor cores. The iPhone 6s disproved the notion that smart devices would remain above the fray in this regard. It features a dual-core chip known as the A9, the first multi-core device for an Apple smartphone. The media are already investigating the rumor that Apple will double or, more accurately, triple down on this premise with the iPhone 7. Some analysts believe a six-core chip is in the cards, which would make the next iteration amazingly fast. People are already discovering that they can browse better with an Apple iPhone 6 Plus, so triple the computational power would blow their minds. Despite numerous past issues with battery life, including a replacement of malfunctioning iPhone 5s units, Apple has never prioritized this issue. They believe that their batteries provide enough energy to keep a phone running for most of the day, and that should be enough for the average consumer. Given how addicted people have become to their phones, Apple may feel compelled to re-evaluate this decision. One of their major competitors, Samsung, is running an ad campaign based on one of its new accessories. This device will charge a smartphone simply by having the user rest the device on the flat surface of the wireless charging pad. Apple isn’t about to let another company have such a distinct competitive advantage. Expect them to either create a wireless charging system of their own or add solar charging functionality. A significant number of Apple customers share the same horror story. They have allowed their Apple device to get wet. When they try to return it at the Apple Store, the employees at the Genius Bar inform them that they could tell from an internal sensor that the device got wet. This voids the warranty, meaning that the person has to pay for a new device if they want one that works. It’s a huge problem. Apple understands that this practice upsets loyal customers. They want to correct it, and the biggest rumor about the iPhone 7 is that it will include some form of water resistance. In addition, it’ll contain materials that reject dust, preserving the clean look of the phone. Getting rid of dust is nice, but a waterproof iPhone would be a game changer. Every time a new iPhone product debuts, people start to debate the features of the next version. While all the above features are simply rumors at this point, tech reporters have gotten extremely good at uncovering details that Apple would prefer remain secret. At least a few of these are probably true.